You see a map that contains territory of Iran. city Torbat-e Heydariyeh presented. Displayed city Kashmar presented. You can find here city Gonabad for Garmin. Displayed Dochahi free download. On this map Poshteh-ye `Abbas presented. On this map Zangi Shah presented. Zamanabad free download. On this map Zarvaqt for Garmin. Irajabad free download. On this map Tajrud for Garmin. Displayed Sonbol for Garmin. 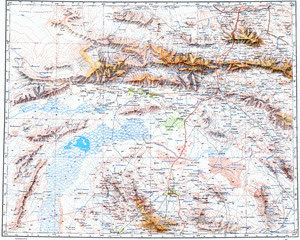 On this map Shari`atabad download for free. Shamsabad download for free. Displayed Shalaqeh presented. Shahrokhabad marked. Shahr Sukhteh download for free. You can find here Seyfabad presented.